My name is Holly, I’m a second-year PhD student in the Section of Neonatal Medicine. This July I was fortunate enough to represent Imperial College at the League of European Research Universities (LERU) Doctoral Summer School, held at University of Zurich. 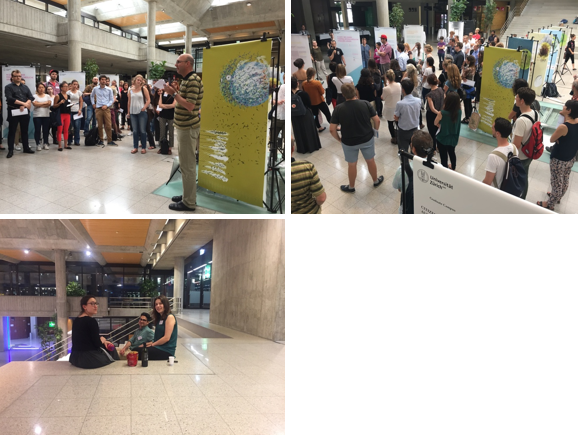 LERU is “an association of 21 leading research-intensive universities that share the values of high-quality teaching within an environment of internationally competitive research.” The topic this year was: Citizen Science – nexus between research and public engagement. If you are scratching your heads wondering what citizen science is it can be broadly described as the involvement of non-professional scientists in research. This can range from small-scale projects like bird watching to large-scale international projects like Zooniverse (https://www.zooniverse.org) and due to the rapid boom in technologies, citizen science is becoming available to a much wider audience. 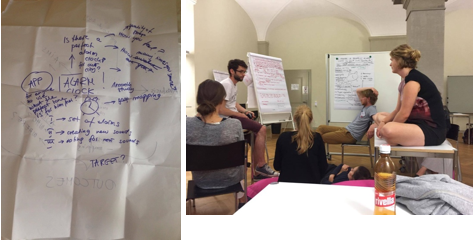 The aims of the LERU Summer School were twofold: to explore the importance of engaging citizens in research and to highlight the ethical, technical and legal issues associated with doing so. Over the week, we examined various definitions of citizen science, designed our own projects and ate a lot of cheese! I had high hopes of exploring Zurich city centre before going to the LERU Welcome Event …but after my crazy experience on the Piccadilly Line at 2.30am to Heathrow, I successfully managed to sleep away my free hours in the hotel. After a short, yet incredibly wet walk to the welcome event we were greeted by the organisers. As the evening progressed and the ‘organised fun’ became more elaborate we learnt more and more about each other including several embarrassing PhD stories! Monday morning kicked off with presenting our PhD projects in the style of the ‘Three Minute Thesis’ competition. In the afternoon, we listened to two keynote speakers. Professor Bruno Strasser’s talk “The Rise of the Citizen Sciences: Rethinking Public Participation in Science” focused on whether citizen science projects will change the way we ‘do’ science (answer = yes!) Professor Effy Vayena’s talk “Citizen Science: Ethical Challenges and Opportunities” then highlighted the issues of quality, accountability, trust and autonomy. Left: Identifying our unique selling points which ranged from being confident to thinking outside of the box. Right: One of the keynote speakers, Professor Bruno Strasser. In the evening, we travelled to another campus – Irchel, where a Citizen Science Exhibition was running. A number of university projects were showcased (http://www.grc.uzh.ch/en/focus/exhibition/CitizenScience.html), a personal favourite of mine was a project involving citizens in mapping plant diversity around the city. The aim of this project is to show the public that the city air is filled with plant seeds that repopulate very quickly. Plant trays filled with sterilized soil are distributed to citizens and are placed somewhere in the city – the garden, in a school, on a balcony or on a roof terrace. It is then simply a waiting game! Photos of plants growing spontaneously in their trays can be uploaded to an online platform where it is possible to compare them to their neighbours or other people in the city. After the Exhibition, we had a BBQ which stayed outside for several hours before a freak thunderstorm caused us to seek refuge inside or brave the weather with broken umbrellas and sodden shoes. Top: Citizen Science Exhibition at Irchel Campus. Note the commissioned art on the sides of each poster – such a fab idea! Bottom Left: Agnieszka, Judi and Ray taking shelter during the monstrous thunderstorm. On Tuesday, we attended one of three workshops: Improv, Storytelling or Crowdfunding. I chose Storytelling run by Dr Mirko Bischofberger, a respected filmmaker who works in science communication and science policy. The workshop was designed to improve and apply basic storytelling concepts to our scientific writing. In the evening, we went to the Uetilberg mountain for a traditional fondue dinner. Post cheese and veal, we decided to attempt the 30 min ‘walk’ (if you can call it that) down the mountain…It’s safe to say we all hurt the next day! Left: The beginning of a very cheesy night. Right: The panoramic view from the top of Uetilberg mountain. HACK DAY! Today was dedicated to working on our Citizen Science Projects. We laughed when one of the organisers said we could stay at the Graduate Campus until 11.30pm….until it got to 10.30pm and my group was still there suffering with acute cabin fever! Thankfully we managed to turn our alarm clock idea into a demo app (LetsWakeApp) in under 24 hours! We chose to focus on an alarm app because over the last few years there has been an explosion of sleep related apps. There is however, a lack of research on the types of sounds that wake you up and how they make you feel once you’re awake. The LetsWakeApp project aims to bridge this gap in knowledge by allowing citizens to rate random alarm sounds each morning e.g. did this sound make you happy or sad? Without giving too much away, through citizen participation, machine-based learning, and some snazzy statistical methods, the app will provide the user with a personalised alarm that wakes them up in a positive mood. The LetsWakeApp team in action. After some last-minute pep talks we presented the LetsWakeApp project to a panel of judges that included the likes of Professor Deketelaere (Secretary General of LERU), Professor Kevin Schawinski (co-founder of Galaxy Zoo) and Professor Daniel Wyler (former Vice President for Medicine and Science) Despite some tough competition, our project was picked by the jury and we won 2500 CHF (£1,900), to develop our project!! In the evening, the winning teams (LetsWakeApp and AstbeSTOP – the student choice) presented at the Graduate School’s Annual Ceremony. Left: The LetsWakeApp Team. Middle: Ray showcasing a demo of our app. Right: Shauna (L) and I (R) celebrating the LetsWakeApp win. Alas like all good things, the LERU Summer School drew to a close. On reflection, I had an incredible time that I know will lead to some very exciting opportunities (keep your eyes peeled for the LetsWakeApp). Left: The city of Zurich. Right: My first experience of a double decker tram.